Colca ValleyAt 164 km to the north of Arequipa city (3 hours, 30 mins by car approx. 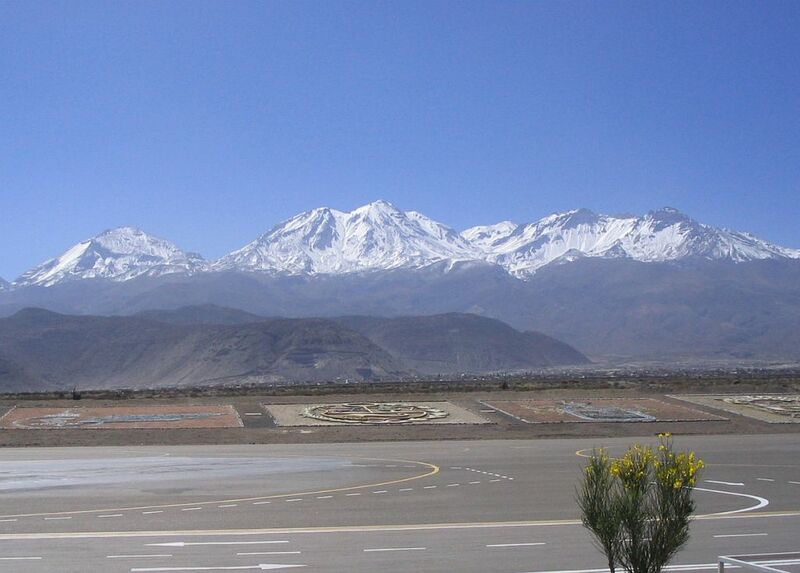 ).It is located in the north east of the Arequipa department. The highest point is the inactive Ampato volcano (6288 masl) and the lowest the confluence of the rivers Colca and Andamayo (970 masl). 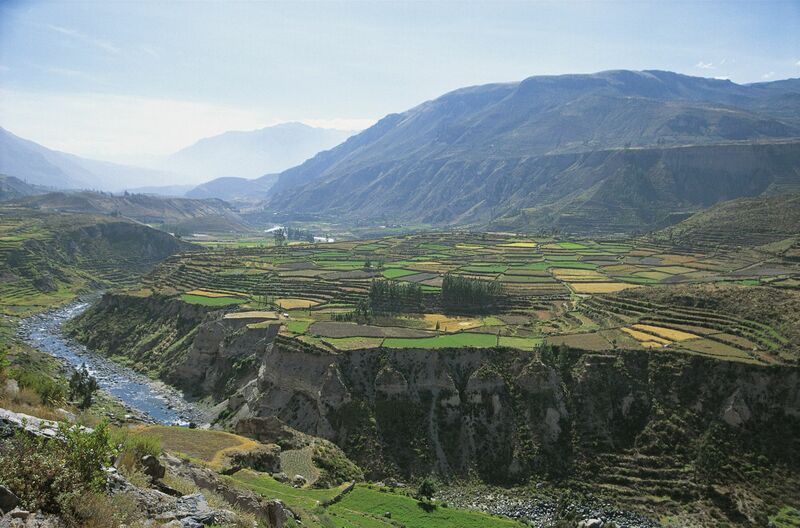 The Colca valley has an extensión of 100 km length and occupies only a sector of the Colca river basin, which is located between the Callali and Huambo districts. There are 16 towns of descendants of the ethnic groups of the Collahuas and Cabanas, heirs of a rich cultural tradition the towns of Chivay and Cabanaconde are the most visited by the tourists.In Cabanaconde you can appreciate condors in their flight from the viewpoint of the Condor Cross, the Colca Valley comprises the South American tectonic plate, it lodges a volcano in activity called the Sabancaya, which is located between the volcanic bulk of the Hualca Hualca, this Valley has a great diversity of flora and fauna. Among the most representative species in fauna there are the Condor, the kestrel, the pilgrim hawk and the mountain perdiz. At 30 km to the west of the Chivay locality (1 hour by car appox.) is one of the deepest of the planet, it is 3400 mts deep in it deepest point in the Canco locality. The Coropuna, Ampato and Sabancaya volcanoes are part of the Canyon landscape. Cotahuasi Valley and CanyonAt 375 km to the north-west of the Arequipa city (9 hours by car appox. )they are composed by different altitude floors that make the conditions for a great biological diversity in flora and fauna. 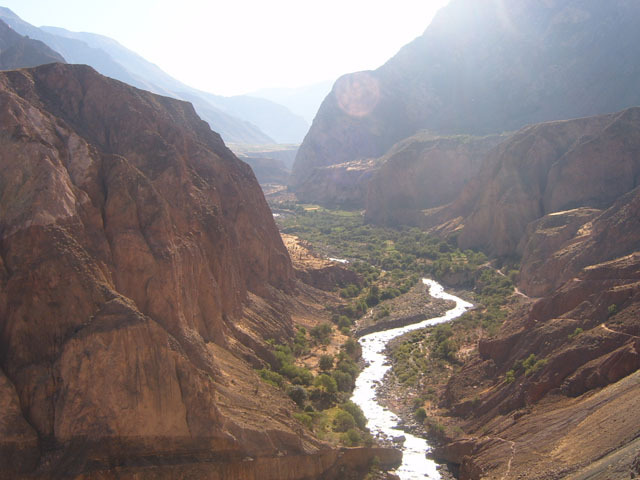 Tha Cotahuasi Canyon has 12 life zones and three ecological regions, besides it is considered the deepest Canyon in Peru (3370 mts). 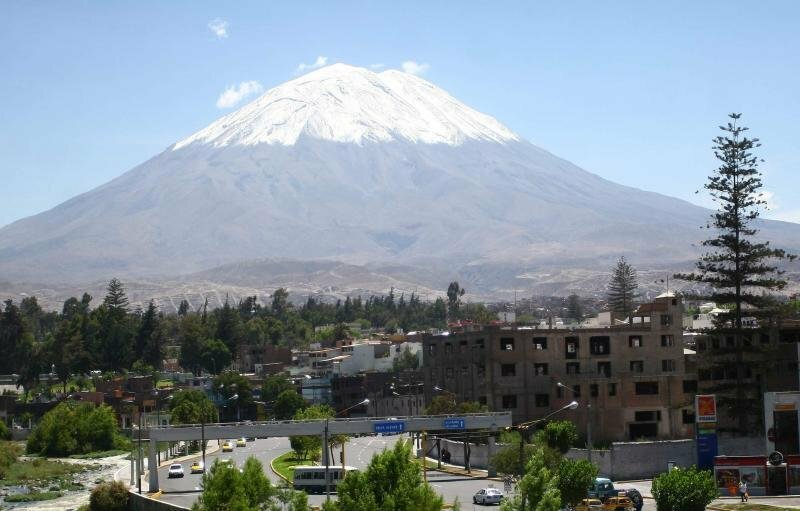 In the way from Arequipa to Cotahuasi one can appreciate the Coropuna Volcano (6425 masl) whose top is considered the highest in the Arequipa department and the third in height in Peru. Misti VolcanoLocated at 17,5 km to the noreast of the Arequipa city, you will arrive to the skirts of the volcano in about 1 hour and a half approx. The Misti, with its 5822 mts heigth is the icon of the city . From the top you will be able to see the whole of Arequipa city , the Chili river, and the Volcanoes Chachani and Pichu Pichu. To reach it has been since the viceroyalty a difficult goal , but it was reached in 1667 by an expedition directed buy the por una expedición dirigida by the Dominico Alvaro Menéndez. Starting the trip from Arequipa City (2 hours by light truck 4 x 4 approx.) You arrive to the base camp, from this point you start a walk of about 6 hours till the top. It is considered the easiest mountain to be climbed in Peru, this volcano with more than 6000 -6075 mts height - is still active ( the crater was not able to be located because it got degradated ). The lava is still visible and there are small precipices and moraines. To get to the top two days and one night are required. At 140 km to the north east of the Arequipa city by the road to Puno ( 4 hours by car approx.) 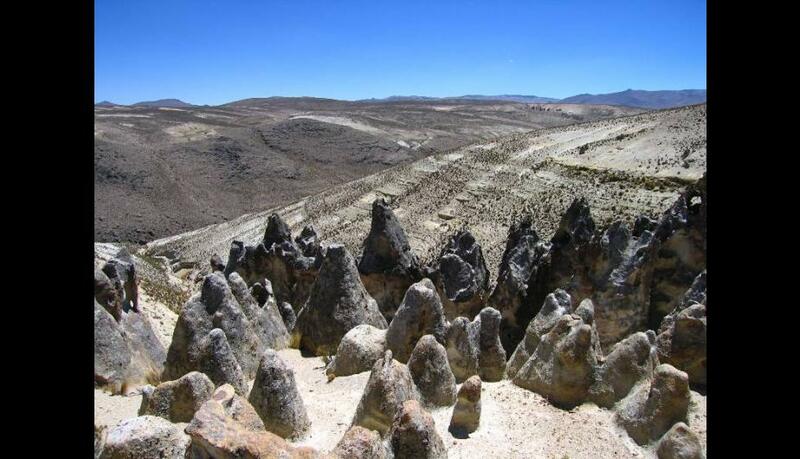 we can find a complex of stone structures that have taken the appearance of a misterious petrified forest. The erosion has modeled the stones giving them a peculiar aspect. The place is easily attainable because it i s located close to the road Arequipa-Juliaca. At 88 km to the north of the Arequipa city ( 1 hour and 45 min by bus approx.) 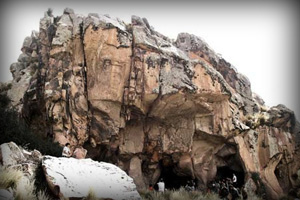 following the road to Caylloma within the limits of the National Reservation of Salinas and Aguada Blanca, they lodge more than 500 samples of Rock Art. At 159 km to the west of the Arequipa city ( 2 hours and 10 min approx. 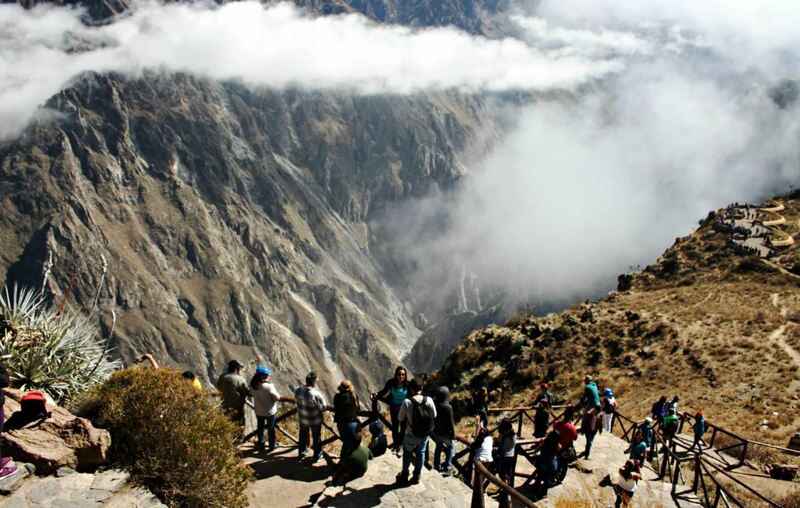 by bus ) you can get there starting the trip from the Colca Valley by the Sihuas Pampas: to get there directly from Arequipa you should take the route to Lima, and to deviate 7 km when reaching Corire ( district of Uraca ). 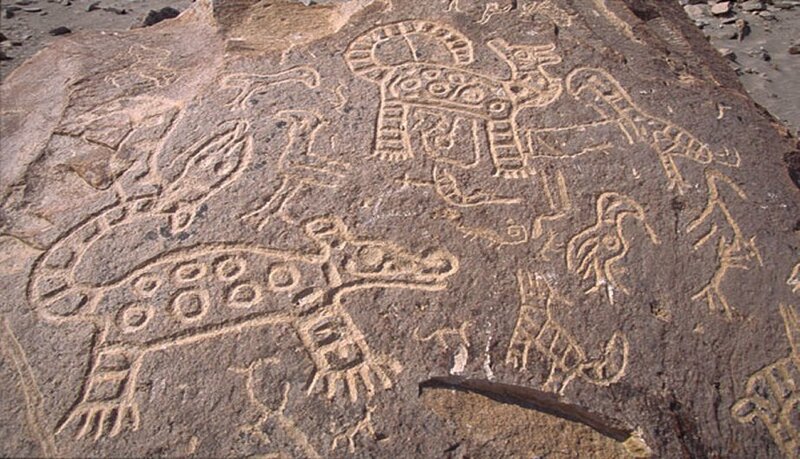 The engravings represent figures of plants and animals such us birds, mammals and reptiles, anthropomorphous beings and geometric forms. The used teniques vary from the struck up to the percusión.The extensión of this area is of about 5000 sq mts and the founded engravings date from the 500 B.C. At 35 km to the north east of the Arequipa city (1 hour, 30 mins by bus approx. ) it englobes about 367 000 hectares and was created with the purpose of preserving important groups of flora and fauna species, to protect natural atmospheres that were about being collapsed, as web as for protecting the vicuña by a repopulating program. 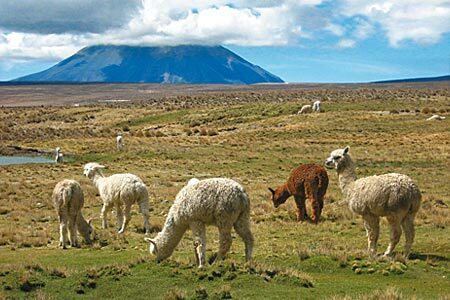 The Reservation is between the 3500 and 6000 masl.within it we can find the Misti ( 5825 masl) Chachani (6075 masl ) and Pichu Pichu ( 5664 masl) volcanoes. Among the most representative species of the reservation outstand the Vizcacha, the fox, the condor and the Andean flamenco or parihuana. Scientists have determined the existence of about 169 animal especies, 24 of which are mammals ( two forms of south american camelidae included here ), 138 kinds of birds ( among which outstand the plonger ducks, eagles and kestrels) 3 species of reptiles, 4 of amphibians and 3 of fishes. 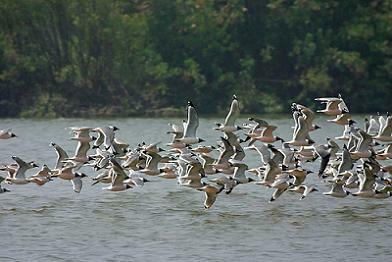 The Salinas lagoons are considered a privileged place to observe the parihuanas. At 277 km to the norwest of Arequipa city ( 10 hours by car approx.) 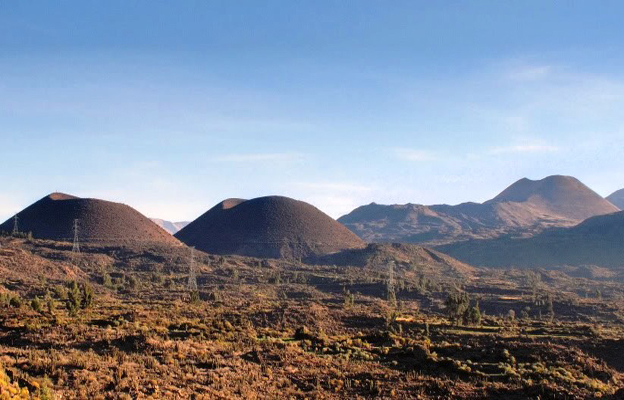 the Volcanoes valley was the center of the convulsions of the volcanic range about 200 thousand years ago. Nowadays we can appreciate the extense lava layer on which about 86 inactive volcanoes have appeared. It is at a height of 3587 masl. At 143 km to the southwest of the Arequipa city (4 hours by car approx. ), a 8t km to the south going to the Mejia beach and at 14 km to the south of Mollendo it has 690.6 hectares of extensión and comprises different habitats that include marshes, muddy places, totorales, mounts and river estuaries as web as sandy beaches. It is ideal for observing birds. 195 species have been registrated there from which 75 are resident species ( you can find them along the whole year ), 6 are marine species and 80 are migratory birds that travel from so far places as the peruvian jungle or the artic.